We’re a pretty tech-friendly family, I’d say – we love our gadgets! 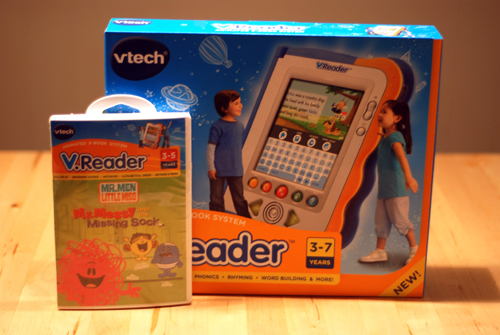 So, when VTech sent us the new V.Reader and extra software to review, I think I was almost as excited as J was when it arrived. 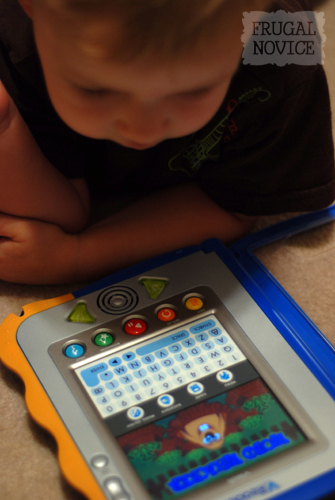 The V. Reader is a new animated e-reader system for kids aged 3-7 – it’s like a Kindle for kids. The V.Reader is about the size of a paperback book, and it has a clear cover that can be folded all the way back when not in use. I like the option of having the cover (especially when it’s small children that’ll be using this!) but also that it can easily be tucked out of the way, held in place with a small magnet. Even when the cover is closed, you’re still able to use the buttons at the bottom to turn pages of the books. There’s also a stylus contained at the bottom of the V.Reader for use on the touch screen – fingers work, too, though! Another feature of the V.Reader that’s pretty exciting is that you can connect it to the computer to download more content. A download library on the VTech website will be available soon to provide some free titles, more themes, and avatars for customization. There’s a headphone jack, which I think every parent knows is a valuable thing! The V.Reader takes 4 AA batteries, and so far we’ve used it a ton with no sign of the batteries dying. J was very excited to try out his new “computer book” and was especially interested in the stylus, I think because he’s seen his dad use one on things before. We tried out the software that comes with the system, called, “What’s That Noise?” First J chose to have the story read to him. I was really impressed with how interactive it is. The words appear on screen and are also read by a narrator. 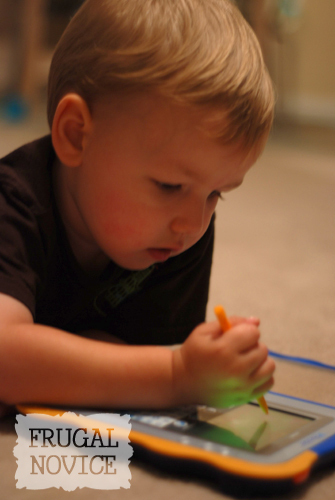 As each word is spoken, it changes color so the child knows what point the narrator is at. The pictures in the story move, too, and J thought it was fun to touch different items on the page and see what they would do. After trying out the story, we decided to see what the game was like – it’s called Word Whacker, and you catch letters from moles that are wandering around the screen to complete words. J loved this game, and after just a few turns he had figured out how to play the easy level all on his own. We also got to try out another title available for the V.Reader – Mr. Messy and the Missing Sock. We really liked this one because it had a TON of game options, like matching socks with upper-case letters to those with their lower-case counterparts. We took the V.Reader with us on our trip to San Antonio this weekend, and were really glad to have it. It provided easy entertainment for the car and hotel, which can be a lifesaver in cranky moments! J is a little on the young side for this, as he’s just about to turn 3, but he still had a lot of fun with it – we just needed to be there to help him get started in selecting items off the menu, and then he could play on his own and feel like a big kid. We let our friends’ 6-year-old daughter try the V.Reader, too, and she had a blast reading the stories and playing the games. It gave me a good idea that this is something we’ll be using for years to come, which isn’t something you can say about a lot of toys. Update December 1: We received the V.Reader back in June, so it’s been over five months since we first tried it. I thought you might like to know how we feel about the V.Reader now after having had it – I mean, if you’re purchasing this you want to know if it’ll have staying power with your children! First off – J likes this just as much (if not more) than he did when he first got to try it. He is older now (about 3 1/2) and I think he “gets” it a little bit more. He asks to get it down and play with it all the time, and I love that it is educating him while he plays. We’re planning to get him the Toy Story 3 cartridge for Christmas.Brian and I both use the iPad, and I think this makes him feel like he’s got a “big boy” computer game. I’d rate the durability of the V.Reader as very high – it is still in great shape, which is saying a lot with toddlers/preschoolers! The variety of games available is a huge plus, and I like that there’s a touch screen AND a keyboard, which gets kids used to using both type of devices. I think this is a perfect gift for the age range suggested – 3 to 7 year olds. When J first tried it he wasn’t quite 3, and although he really enjoyed it, he is getting the most use out of it now that he is a little bit older. I believe this is a toy that we will use for years to come, both at home and on the road. If you have any questions about my experience with the V.Reader, just leave them in the comment section or shoot me an email! I’m at: frugalnovice [at] gmail [dot] com. I’m happy to help give you any insight you need as to whether this would be a good purchase for you or not. The V.Reader is available exclusively at Target now, and will be available at other stores nationwide in August. You can find it online here, too. You also have the chance to win one! 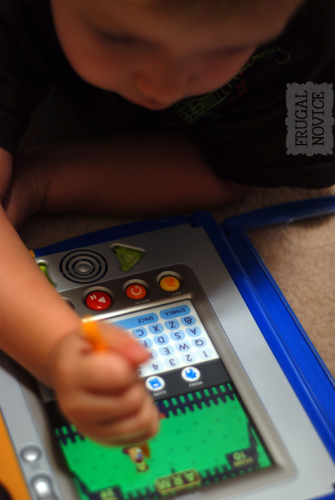 VTech has given me the opportunity to host a giveaway for one V.Reader system. The winner of this giveaway will receive one V.Reader system, valued at $59.99. This contest is open to all U.S. Readers. Entries will be accepted until midnight CST Tuesday, July 13. A winner will be selected with random.org. Mandatory Entry: Subscribe to my RSS feed, then comment letting me know you’ve done so. If you already subscribe, just comment letting me know. Note: VTech provided a V.Reader and software for me to review and keep, but my honest opinions were provided. I was not compensated monetarily for this post. How long does it live before you have to change the batteries? Trista, the battery life seems to be great – we still haven’t replaced the batteries yet. 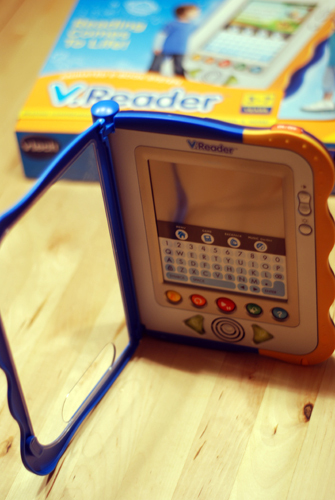 We saw the vreader for the first time this weekend while doing a bit of Christmas list shopping at ToysRUs. Gigi has wanted her own ereader since she first saw mine. She’s only four years old but LOVES books! We’d love to win a vreader!! THANK you for your v.reader review…. I have been looking at them for my 3yr & 5yr olds and your review was very thorough. I really appreciated it! I have also subscribed to enter to win the v.reader. I look forward to future readings from you! I’m assuming that the reader “reads” the books out loud, right? Also, does it have the ability to press a specific word and hear that word? Thanks! Nicole, I think it depends on which cartridge you have in. The one we have does read the books out loud. I don’t have it with me right now and can’t remember about the ability to press a word and hear it, but I would assume you can. Also – if you have an iPhone or iPad, there are Dr. Seuss apps that read stories aloud and let you touch words to hear them individually. Hope that helps!